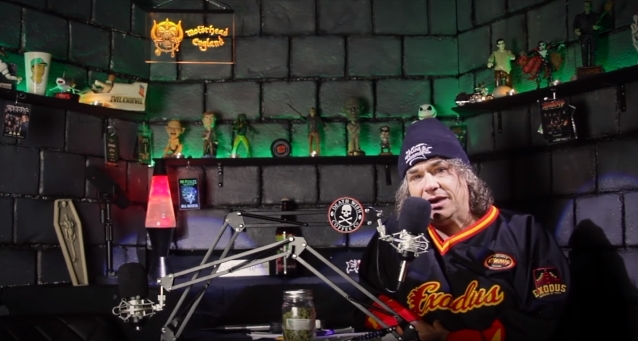 Share the post "EXODUS Frontman Reviews MÖTLEY CRÜE’s ‘The Dirt’ Biopic: ‘I Was Riveted Through The Whole Thing’"
EXODUS frontman Steve “Zetro” Souza has launched a new YouTube channel, Zetro’s Toxic Vault, where he has begun posting videos of him talking about whatever is on his mind, including tales and stories from his 30-plus-year career as on-and-off singer for one of thrash metal’s most influential acts. Souza, who previously fronted EXODUS from 1986 to 1993 and from 2002 to 2004, rejoined the band in 2014 following the departure of the group’s lead singer of nine years, Rob Dukes. Souza recently confirmed that fans will have to wait until at least the end of 2019 or early 2020 before EXODUS‘s follow-up to 2014’s “Blood In Blood Out” album. Although it was originally reported that the veteran San Francisco Bay Area thrashers would go into the studio in October 2017 to begin recording the new effort, it now appears that the band will not start work on the next disc until guitarist Gary Holt is done playing with SLAYER as part of that group’s final tour.